Star City without Oliver Queen is nothing new for Arrow. We’ve seen how crime and chaos reign when the city’s hero isn’t there to protect his home before. However, we’ve rarely seen Oliver Queen without his home, without any loved ones around him to help calm the voices of anger and self-doubt and guilt, to help stifle his worst impulses. 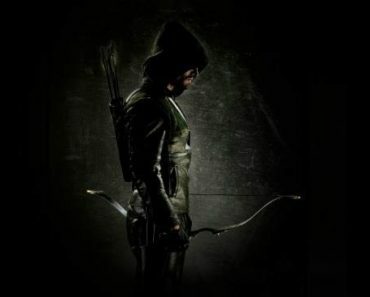 Since the end of the Season 6 finale, Oliver has been, as the title of the Arrow Season 7 premiere states, “Inmate #4587.” During these past five months in prison, he has been isolated from his family and friends and also forced to live alongside criminals, many of whom he put away himself. These villains from past seasons of Arrow consistently try to antagonize Oliver throughout the episode, but he mostly ignores them, only defending himself when he has to and doing his very best to keep his head down. He wants a spotless record so that his sentence can potentially be reduced, allowing him to reunite with his wife and son sooner rather than later. And Oliver does understand what Felicity is saying, better than anyone else could. His journey as the Green Arrow transformed from a revenge-seeking, murderous crusade into a mission of justice, peace, and redemption. Throughout the past six years, Oliver has discovered that battling criminals and fighting for what is right are truly a part of his identity. 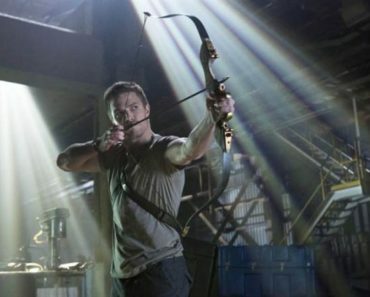 There is no separating Oliver Queen from the Green Arrow; it’s a lesson that Oliver and the audience have learned many (perhaps too many) times throughout Arrow‘s run. While there may be a GA impersonator on the streets of Star City right now, keeping their own list and crossing off names, he or she doesn’t fully represent the hero that Oliver has become. However, in order to keep that heroic spirit alive, in order to maintain that integral piece of his own self, Oliver can’t turn the other cheek when the criminals in prison go after him—he needs to respond and make it clear that prison bars have not changed anything. He’s not weak. He’s not a coward. He’s still a hero. 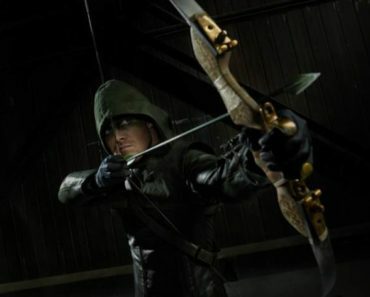 He’s still the Green Arrow. But could Oliver take this type of behavior too far? 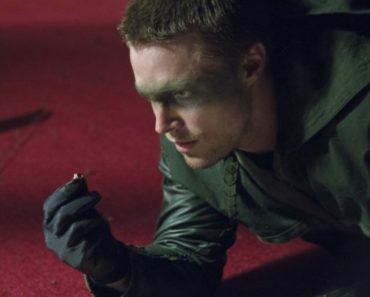 Is there a chance that the violent nature of prison life could cause Oliver to become what he most despises, what he’s fought so hard against over the years? It’s definitely possible, and I am curious to see how Season 7 explores this internal struggle for Oliver as he remains isolated from those who matter most. 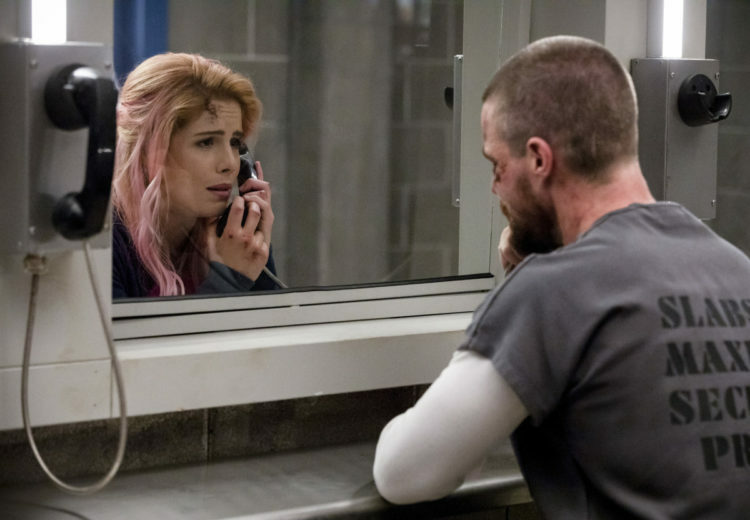 Just as Oliver attempts to gain control in prison, Felicity also seeks more power in her own life. Her promise to “fight back” against Diaz and the actual, physical fighting we see from her in “Inmate #4587” are fantastic on their own. But her proclamation to Oliver, along with her insistence that he won’t “get to decide this time,” serves a greater purpose than revealing that she plans to take down Diaz herself. 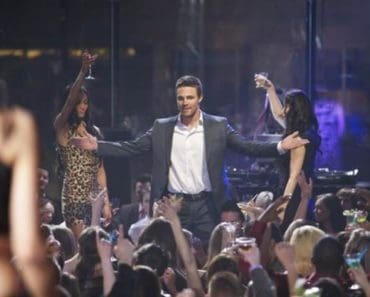 In this moment, Felicity reclaims equal power of her own life and of her relationship with her husband, who made a decision to turn himself in during the Season 6 finale without consulting her, a decision that caused her to go into Witness Protection and raise a son on her own, a decision that dramatically changed her life forever. During this conversation with Oliver, Felicity reemphasizes the importance of equality in their relationship; if they are truly going to be a unit moving forward, in both marriage and in their mission to protect Star City, they need to continue to communicate with each other, continue to be honest with each other, and continue to trust each other’s instincts. With this one line from Felicity and Oliver’s quiet but understanding “Okay, okay” afterwards, the two of them are agreeing that there is no longer room in their relationship for secretive, self-sacrificing actions or hidden plans that will be revealed “when the time is right.” From now on, they’re in this together in every possible way, and they need to trust that they’ll support each other, even when they disagree with one another. Because, simply put, that’s love. While the Oliver and Felicity material in “Inmate #4587” is strong, the rest of the premiere is a little uneven. Diggle doesn’t receive nearly enough screen time, although his conversation with Oliver reassures the audience that the bond between the two friends remains as solid as ever, despite the manufactured drama that occurred between them last season. Not only has Diggle been keeping a 24/7 watch on Felicity and William over the past five months, but he has also been using ARGUS resources to try to track down Diaz, much to the organization’s chagrin. Hopefully, the writers have some powerful material planned for Diggle in Season 7 that doesn’t involve him wanting to wear the Green Arrow suit. Meanwhile, the current conflict between Dinah, who is now Star City police captain, and Rene feels like a forced rehash of the team split from last season, and I really hope it resolves itself soon because both Juliana Harkavy and Rick Gonzales deserve better writing. And the flash-forward twist at the end, involving an adult William 20 years in the future talking with a much older Roy Harper on Lian Yu, has me both excited and nervous. While I could see this flash-forward structure going terribly wrong, I love that new Arrow showrunner Beth Schwartz and her writers’ room are taking big swings, and after speaking with Schwartz at San Diego Comic-Con and hearing her vision for this season and the series as a whole, I’m willing to take a leap of faith with her as she tries something radically new. It’s Season 7, so why not shake things up a little? I’m along for the ride. Let’s just hope it’s smoother one than last year. I love where Rene starts this season. Teaching at-risk kids in the Glades how to defend themselves as a way of helping to better Star City fits with the character we got to know and love throughout Season 5 and not the obnoxious, immature version of Wild Dog we saw last year. In addition to not getting much of Diggle in the Season 7 premiere, we also don’t get much of Black Siren/Laurel either. She is now Star City’s DA, and I’ll be curious to see how she’s using her new position of power in future episodes (Perhaps she uses it to honor Quentin after his death in the Season 6 finale?). An even better Felicity moment, though: When she tells Diaz, “Thank God you monologue a lot,” during their battle at the safe house. What did you think of the Arrow Season 7 premiere? Did you enjoy it? Were you shocked by the episode-ending twist? Comment below and let me know.